While many marketing executives ponder the value of the multiple millions spent on Super Bowl promotions, hard evidence shows Mercedes-Benz scored high in Super Bowl XLVII, culminating a well planned and implemented strategy to introduce its smallest and first front-wheel-drive vehicle in the US. It was a visionary undertaking for the German luxury brand that may well have began when the firm plunked down untold millions for the 10-year naming rights to the many-storied, 40-year-old New Orleans Superdome. That action laid the groundwork for the multimedia campaign launched January 20. "The goal was to create a compelling story which would introduce a new product - our 2014 CLA coupe,” said Steve Cannon, president and CEO of Mercedes-Benz USA, adding, “At a first-ever price point in a way that would not only get people talking but also begin to get them interested and engaged." The brand calculates, based on data from ImageTrack and Kantar Media – IEG's sponsorship and advertising broadcast monitoring service, that the fact the Super Bowl was played in the Mercedes-Benz Superdome garnered them 6 minutes and 19 seconds of exposure during the game, valued at approximately $4.6 million. Adding in the publicity the fourth-quarter provided the CLA, the total media exposure was projected to be worth over $12 million. However, as we said above the actual campaign started three weeks prior with a series of advertising teasers comprised of four 15-second spots and one 30-secord companion piece that went into rotation during the AFC championships on January 20, themed "Something…is coming,"
The next day, an online video release flipped the stereotypical commercial with Kate Upton in a Mercedes while a gaggle of good-looking guys washed her car. The YouTube post scored nearly three million views by the next day without any paid media effort. A couple days later the firm released a long version of the Super Bowl ad titled Soul, followed by yet another called Behind the Scenes. Along with the actual Super Bowl spot, the four videos have racked up well beyond 13 millions views, including the 60-second version of Soul recently added to the series. Nevertheless, the idea is to get people to buy cars, not just watch videos. It’s about disseminating information and building excitement for your product as well. "To really amortize your investment, you've got to go deeper than measuring entertainment popularity. The real magic lays in converting awareness into consumer interest, said Bernie Glaser, VP of marketing for MBUSA. “Engaging people enough to go out of their way to find out more about your product -- that's the real payout." Soul is set in New Orleans where MBUSA has strong philanthropic ties, and focuses strongly on the CLA’s primary selling point - the price. In the storyline a satanic Willem Dafoe beguiles a young man with a Mercedes CLA and Kate Upton, a dance-off with Usher and Formula 1 racing for nothing more than his mortal soul. Nearly drawn into the clutches of his tempter, he spots the billboard touting the CLA's $29,900 base price and brushes off Dafoe saying, "I think I've got this." You remember – you saw it right? Apparently a lot of us did and had our curiosity piqued. 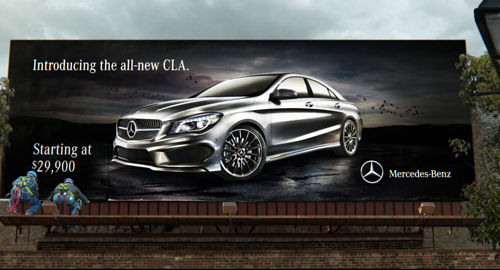 Edmunds.com noted the CLA had the highest jump in vehicle inquiries during the Game and during the next 24 hours. Roughly 20 percent of the searches in the fourth quarter were looking for the new Mercedes-Benz. The brand’s queries on the Edmunds site were up 122 percent over the average across the last four Sundays, giving Mercedes the top spot among all luxury makes during the Game. "The CLA was the number one shopped vehicle on Edmunds.com over the weekend," beamed Vice Chairman Jeremy Anwyl from Edmunds.com. "It is the best performing ad campaign I have seen since I started tracking Super Bowl ad performance. The CLA obviously connected with a vast audience, demonstrating Mercedes Benz is enjoying early success as it reaches to a new generation of luxury vehicle buyers." The ad will gain new life during the Academy Awards in late February, not to mention when the CLA makes an appearance during the Mercedes-Benz Fashion Week starting today and again at the U.S. Open, the PGA Championship and other high-profile events that MBUSA sponsors. Digital and social media activations will be released over the next few months (including a current Facebook promo offering fans an expense-paid trip to New York in conjunction with the New York Auto Show to see the CLA up close) as the September launch of the sporty 208-hp four-door coupe draws near. Marketing moguls could well make the Mercedes-Benz approach to Super Bowl marketing into a textbook example. Acura, Audi, BMW, Cadillac, Infiniti, Jaguar Land Rover, Lexus and Volvo should all take note.